On September 22 in Utah’s high desert where Orbital ATK often conducts loud and fiery rocket motor tests, the company completed a much more low-key, but significant milestone on the path to send humans farther than we have ever gone before. The successful “aft skirt off-motor hot fire test” demonstrated the avionics and Thrust Vector Control (TVC) systems of the solid rocket boosters that will help power NASA’s new heavy-lift rocket. Known as the Space Launch System (SLS), this heavy-lift rocket will soon embark on bold missions to explore deep space. Each SLS rocket will be powered by two, five-segment solid rocket boosters provided by Orbital ATK. As the booster integrator, Orbital ATK is bringing together and testing all components of a five-segment solid rocket motor in preparation for next year’s booster qualification test, known as QM-2. Orbital ATK’s Promontory, Utah, facility will host the QM-2 test, which represents a significant milestone as the booster progresses toward its first flight scheduled for 2018. 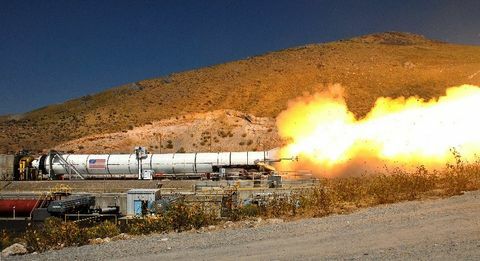 The aft skirt off-motor hot fire test utilized a prototype SLS avionics command and control system to operate the booster’s thrust vector control system. 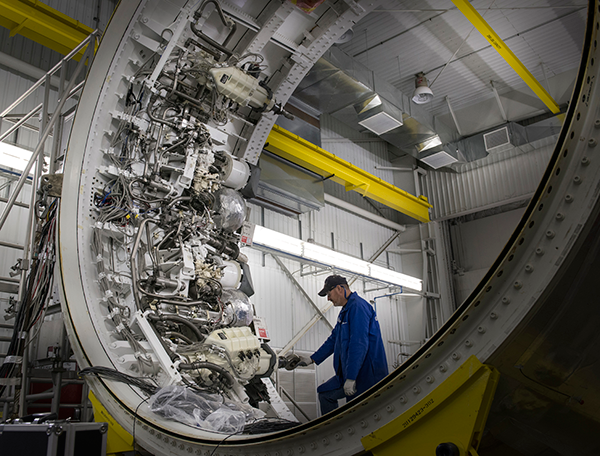 The new, advanced avionics system is a critical aspect of the twin SLS boosters. It controls power distribution, steers the boosters, initiates pyrotechnic devices, and communicates with the flight computers. 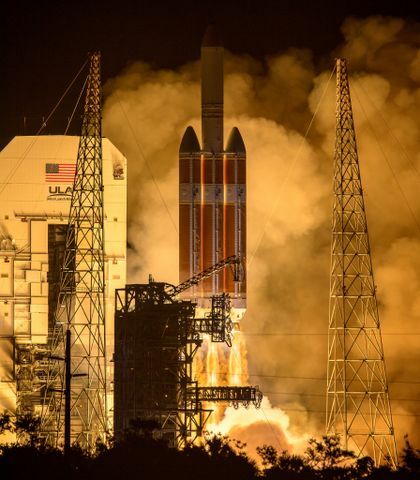 While the avionics are new, the thrust vector control system it commands is the same time-proven system used by NASA’s space shuttle boosters. The hot-fire test simulated the test cycle that will be used during QM-2, which closely resembles real flight conditions. This activity was an additional opportunity to demonstrate successful operation of both the avionics and TVC systems using the “test-like-you-fly” approach. 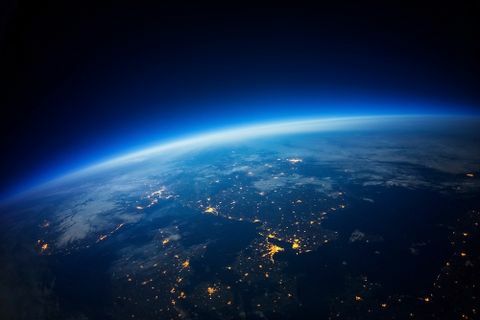 Orbital ATK developed the avionics subsystem in Clearfield and Magna, Utah, with support from NASA’s Marshall Space Flight Center in Huntsville, Alabama. Key partners supported Orbital ATK throughout this test series, including L-3 Cincinnati Electronics in Mason, Ohio, and Southern California Braiding, an IEC Electronics Company in Bell Gardens, California. Cincinnati Electronics provides the avionics system boxes, and Southern California Braiding is responsible for the cable harnesses. Both suppliers have been integral to Orbital ATK throughout the development lifecycle of the SLS booster. 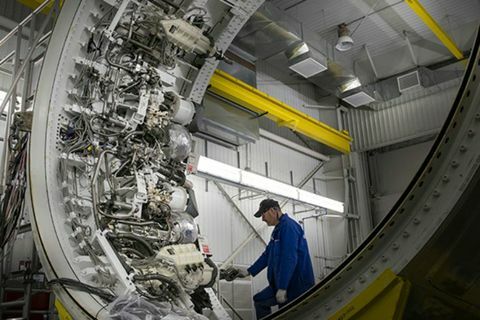 The avionics subsystem and hardware is shown in Orbital ATK’s Promontory, Utah, Test Bay T-97, in preparation for the September 22 avionics and controls testing for NASA’s SLS booster. The hot-fire test simulated the test cycle that will be used during next spring’s booster test (QM-2), which closely resembles real flight conditions.